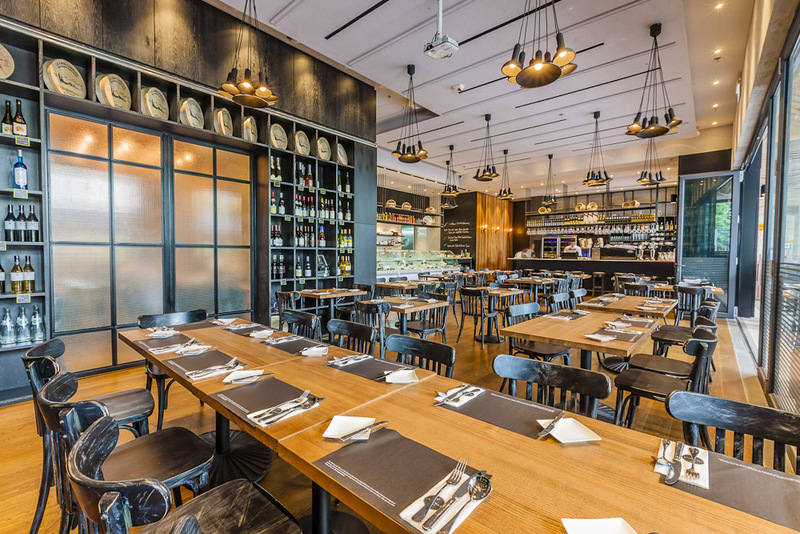 I’ve eaten several times at the Chez Patrick Deli in Wan Chai’s Brim 28 and with its aeons of spacious indoors and alfresco seating, it’s something of a hidden gem – bustling during office lunch hour, but a wee bit desolate anytime else. 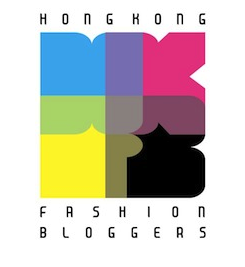 And if you’re at a loss for what on earth Brim 28 is, don’t worry – most HK taxi drivers are right there with you! To borrow AA Gill speak, Brim 28 is some Tristam’s attempt to rebrand the Causeway Centre’s dining area (and who alone knows what Brim 28 is actually supposed to mean) – but hey, at least it isn’t an even more obnoxious Hong Kong building development creation i.e. “Laguna Heights”, “Mayfair Plaza” or any other ridiculous result of playing roulette with property names on a Monopoly board. But enough grumbling and onto the food! 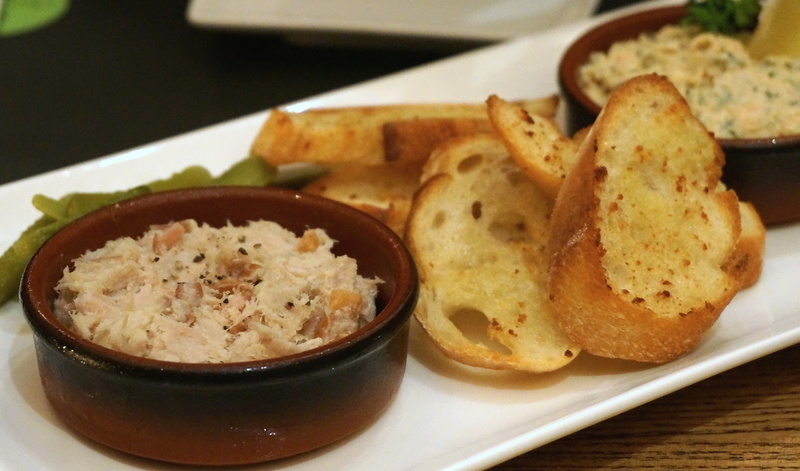 We started with some très délicieux rillettes with croutons – and I had to stop myself getting full on just these alone. I might never manage to be French-chic enough to throw on skinny jeans and a Breton-striped top and look catwalk-ready… but I’d like to pretend it’s just as French-chic to munch my way through pots and pots of rillettes with abandon. Whilst the salmon rillettes were creamy with a zesty lemon note, it was the pork ones that won my heart. I loved that the meat hadn’t been pounded into total pâté form; instead, it was still chunky enough to feel hearty and homemade, and had been seasoned perfectly – meaty, salty, peppery and dangerously addictive. 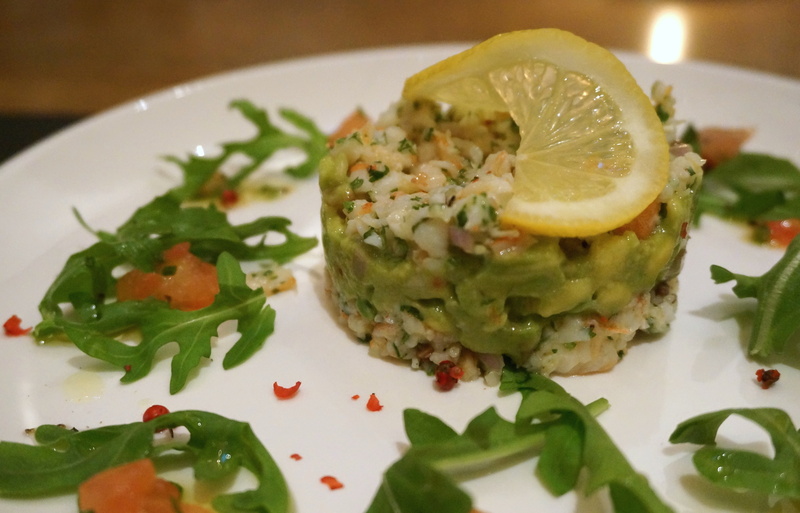 The starter proper was a beautiful prawn and avocado tartare. Light, refreshing, bright and delicate yet still substantial, it was basically summer on a plate. The dish was really brought alive by the addition of crunchy, vibrant pink peppercorns, which made an already lovely dish sing; I imagine it was singing something like that Zou Bisou Bisou song from Mad Men, which I have also been known to sing at similarly whimsical moments. For mains, I chose steak frites. 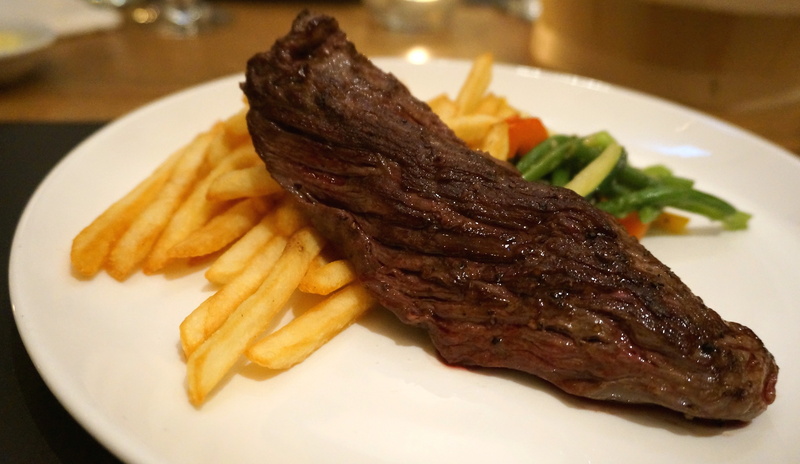 Let’s face it – if it’s on the menu, it’s very hard NOT to choose steak frites. The current cut du jour at Chez Patrick Deli is the “Bavette” Black Angus flap steak, and I have to say that this was one of my favourite steaks in a long time. 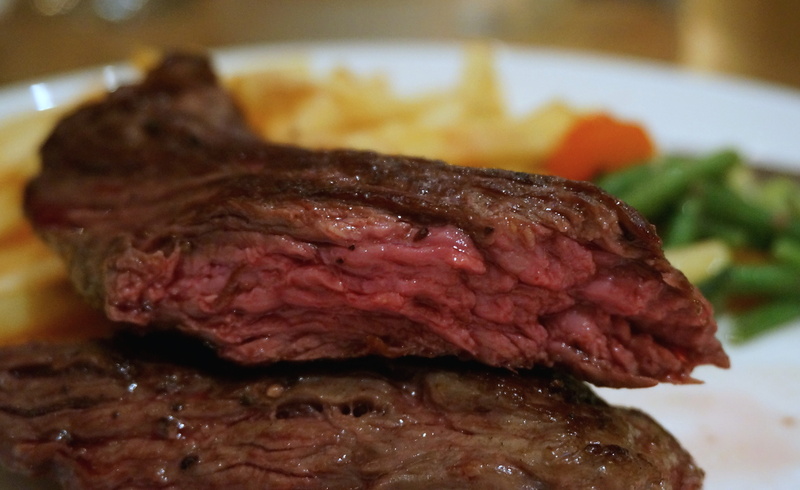 It actually tasted like beef, which is becoming increasingly and oddly rare with many steaks in Hong Kong. The flap is not a particularly refined cut – but that slightly sinewy yet juicy beefiness was actually what I rather liked about it. Meanwhile, the frites hit every cliché with aplomb – golden crispy on the outside, fluffy on the inside – and were even better dipped into the dark, rich and totally moreish shallot sauce. I was very happy with my choice, especially once I tried the other mains round the table (Toulouse sausage, pork chop and red mullet), which tasted almost one dimensional and bland in comparison. Red beef always wins, folks! 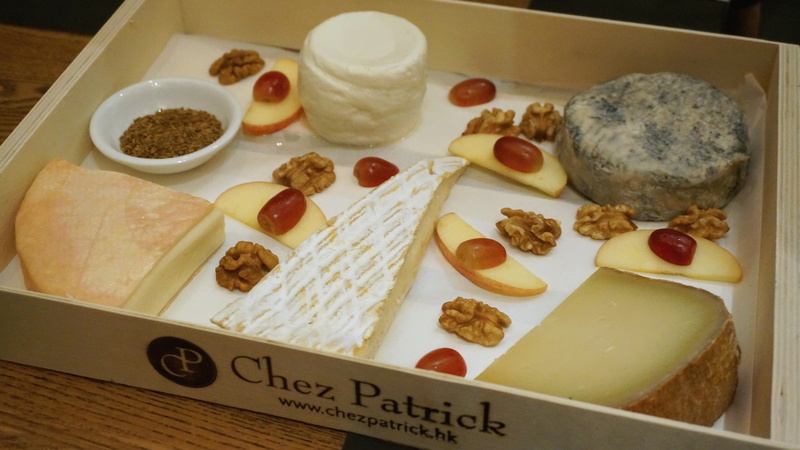 It wouldn’t be a French meal without a cheese platter, and Chez Patrick Deli does not disappoint. I all out LOVED the clever addition of cumin seeds, which combined unexpectedly wonderfully with a slab of strong, creamy Munster (bottom left). I’m not normally a fan of Brie either – it’s often just too intense and mushy for me – but this one (bottom centre) was divine, with a nutty tang that I really loved. And goat’s cheese (top left)… well bring that mother on, because I can’t get enough of that creamy richness! Factor in some walnuts, apple slices and crackers and you have a meal in itself. Chez Parick Deli’s summer dessert special is an Éclair Tagada (based on the strawberry Haribo sweets! ), and I spotted a few looks of fear around the table at how artificially pink and sweet it looked. Not me – I absolument loved it. 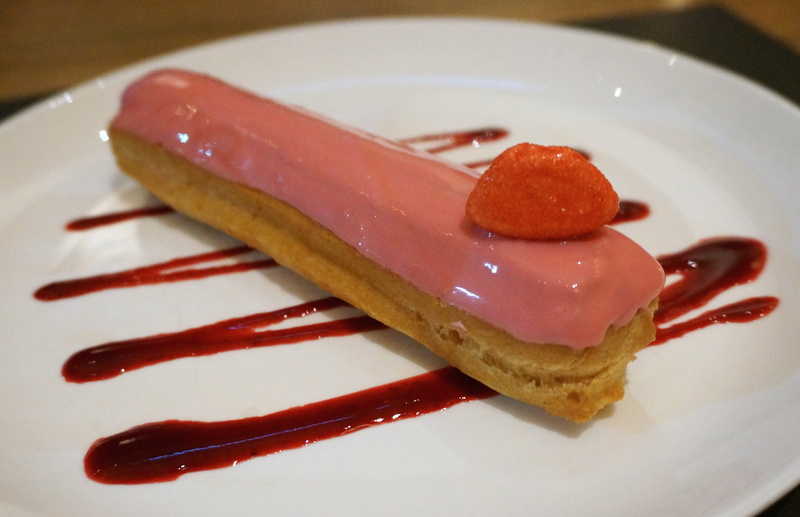 The éclair was a triumph – airy light but buttery soft choux – whilst the summery fruitiness of the showbiz-smooth strawberry cream inside was just right. I often say the best desserts are the messiest and I’m pretty sure I had my face smeared with strawberry cream after this! … And of course, it can’t be a true Rach dessert experience without chocolate. This time, it was a salted chocolate cake that, given it’s a Chez Patrick signature, I was just the teensiest bit disappointed by. 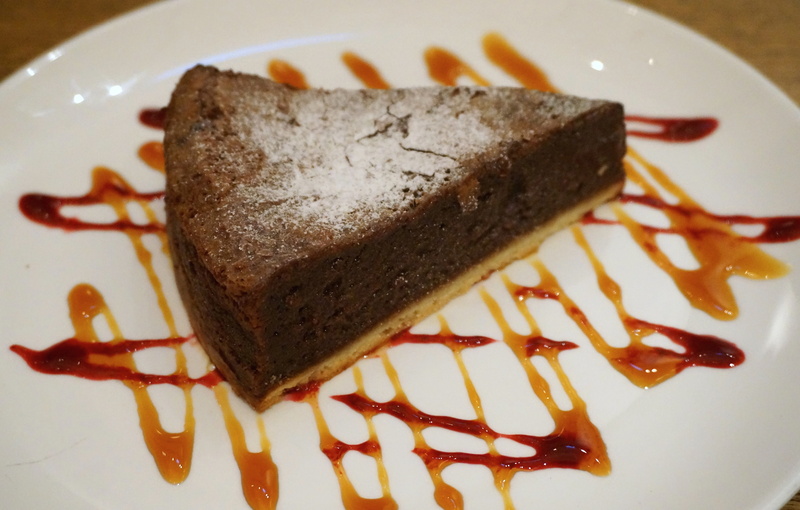 Whilst the texture was textbook – dense, moist, just that little bit gooey – and the chocolate flavour was grown-up rich and not too sweet, there just wasn’t enough salt on there to get me singing Zou Bisou Bisou again. 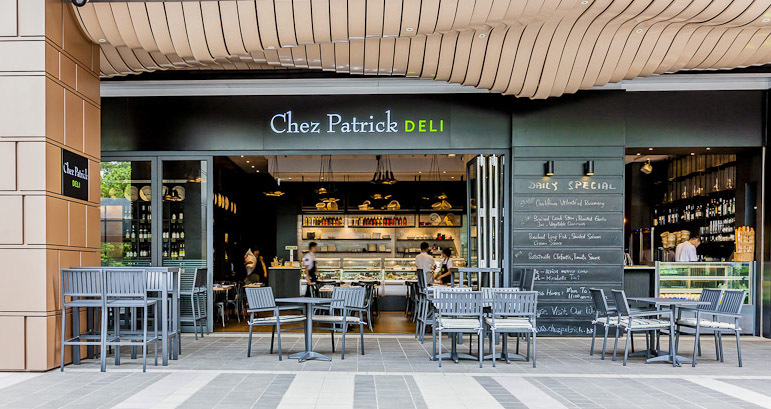 Chez Patrick Deli isn’t the place to go to for boundary-breaking gastronomic invention, but its classic dishes are simple, well executed and reasonably priced; starters cost around $60-100, mains $150-200 and desserts $50. For a satisfying meal away from the Soho madness, it’s worth learning where the hell Brim 28 actually is – your steak frites awaits. Note: this meal was by invitation; however, I have been to Chez Patrick Deli several times before and since on my own and this review is consistent with my general thoughts. This entry was posted in Food and tagged best bistros Hong Kong, best French food Hong Kong, best French restaurants in Hong Kong, best restaurants in Wan Chai, Brim 28, casual dining Hong Kong, Chez Patrick Deli, Chez Patrick Deli HK, Chez Patrick Deli Hong Kong, French cuisine, French cuisine Hong Kong, French restaurants in Wan Chai, restaurant, review, where to eat in Wan Chai. Bookmark the permalink. Le fromage (cheese), of course 🙂 ! would be nice to add a chope reservation book now button to complete the experience on your blog. contact me if you are keen. thanks!